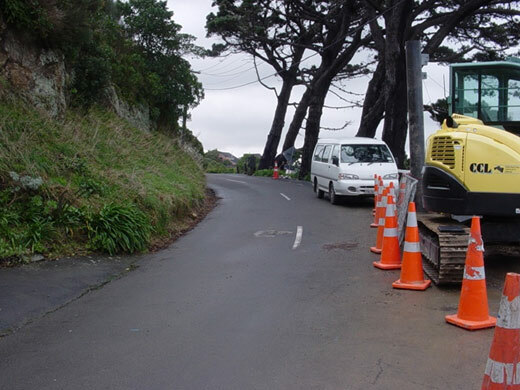 The work involved the replacement of a sewer main at the bottom of a very steep gully below Amritsar Street in Khandallah, Wellington, with very limited access. As all work was completed beside an existing stream and resource consent had been granted, silt control and minimal disturbance was paramount throughout the contract works. Work took place on two sites. One was on a very steep Hill side within Amritsar Street where the existing 150mm sewer main was pipe-burst with a new 160mm HDPE Pipe. All materials and plant had to be carried to the site and a temporary chute was erected to get the drainage metal and builders mix closer to the site. The section to be replaced was approximately 220 metres long, and was broken into four separate pipe bursts. Six new 600mm manholes where constructed on the new pipe work, all launch pits and lateral connections were hand excavated and then backfilled by hand once the new main and connections had been constructed. The second site was further down this steep bank approximately 300 metres below the road in Amritsar Street. Again almost all plant and material was taken to site by hand. A flying fox was constructed to lower materials to site and a winch system was used to help cart heavier components to and from the site through one of the private properties. The existing drain was on the side of a steep bank. A track along the alignment of the drain was cleared and shaped by hand. Again all launch pits, every change of direction, and lateral connections were hand excavated. The 250 metres of 150mm sewer main pipe was burst in 3 sections, the new pipe was assisted around the changes of direction and grade, and a temporary pipe was laid beside the existing main to maintain flows during the construction of the new main. All spoil from the excavations was retained on site with temporary timber retaining walls, with silt fencing used around and over the spoil to minimise any silt from entering the stream below the alignment of the main. Once the new pipe work was in, the guys dropped back and cut fourteen new 600mm manholes and one 900mm manhole into the new line. All lateral connections were completed and, finally, two 150mm concrete lined steel stream crossings were replaced. Once completed, all excess materials and plant were carried back up the hill and removed from site. This contract was completed in very difficult conditions, both with the weather and the access to the site, and it was completed within the contract period to a high standard. There were no accidents or near misses reported throughout the duration of the works. Continuous liaison throughout the works with all residents (particularly the owner of number 40 Rangiora Avenue). Working in and around a live stream. Pipe bursting through changes of grade and alignment. Limited access with no heavy machine access and everything was carried to site including manhole components (Heavy Lifting). The work was completed in two sections. The lower section was completed by Team One and a team of six others and the upper section by Team Two and a team of five others. Construction of a chute to get materials closer to site. The construction of a flying fox. However, the council decided it would require a building consent. The building consent was applied for but, by the time it came through, the teams had already finished the work and we were asked to apply for a demolition permit to remove the flying fox. The team leaders decided to take the risk and attempt to pipe-burst around all of the changes of direction and changes of grades on the alignment of the existing sewer main. The excavation and removal of a section of HDPE pipe, when struck while pipe bursting. To supply all materials, plant and labour to cart to site and install new manhole castings and frame. To refurbish an existing manhole, including benching, water proofing and a new manhole casting and frame. To make repairs to an existing 100mm sewer lateral. To make connections to manholes. There was continuous on-the-job training for all staff members, with some staff working towards their Civil Infrastructure Introductory Skills. During the work we took on two Tradestaff members to assist our team members. They were both given on-site training and have now moved on to become valuable permanent team members. No sub-contractors were used on these contract works. The weather conditions were generally fine, however there were 16 days that were affected by rain, causing the site to become slippery. Very difficult, down a private right of way, through private property on a steep hill side. Ground conditions varied between hard rock, clay and lose material. No, the plans worked OK with the innovative ideas we brought to the contract. The work was completed under budget and the clients, Capacity and Wellington City Council, were pleased with the result. The work was completed to a very high standard under difficult conditions and to contract specifications. Resource Consent conditions were met throughout the work without any environmental mishaps. The work has now been completed for some time and reinstatement quality was such that it is hard to tell where the work was done.